26-Week Babycenter E-mail: 98 days to go--folks, we're down to double digits. AHHHHH!!!! The network of nerves in your baby's ears is better developed and more sensitive than before. He may now be able to hear both your voice and your partner's as you chat with each other. He's inhaling and exhaling small amounts of amniotic fluid, which is essential for the development of his lungs. These so-called breathing movements are also good practice for when he's born and takes that first gulp of air. And he's continuing to put on baby fat. He now weighs about a pound and two-thirds and measures 14 inches (an English hothouse cucumber) from head to heel. If you're having a boy, his testicles are beginning to descend into his scrotum — a trip that will take two to three days. Twenty-six weeks, and I'm finally becoming a morning person again! Earlier this week I was awakened by one of those awful charley horses that could bring someone back from the dead. 5:00 AM and I felt it slowly forming in my upper calf. I literally woke up yelling, "No, no, no, NO, NOOOOOOOOO!" I mentioned it on FB and got some interesting responses. Two remedies I'd heard before: stay well-hydrated and eat bananas (lack of potassium causes the charley horses). Then, I heard one I hadn't ever heard before--put a bar of Ivory soap under your sheets at the end of the bed. Wha? I'm not a huge fan of the smell of Ivory, so I won't be experimenting to see if it works, but I had multiple friends swear it works. Have you heard of any other remedies for charley horses? Charley horses are my least favorite part of pregnancy. Anyway, that charley horse had me wide awake, and thanks to my body practicing for nursing, I wasn't able to fall back asleep. Let's just say that was one of the most productive mornings I've had all year. Other than that morning, I've been waking up voluntarily at 6:00 AM or so. I love mornings: Quiet house. Time to do stuff I don't normally get to do (this morning I baked blueberry muffins--I love blueberry season). The cool morning air that makes it desirable to be outside. Ahhhhh. I also have a confession to make--I never nested with baby #1. I kept waiting for it to happen--wanting it to happen, in fact. Being the Type-A that I am, I always have a to-do list calling my name. And I just knew that when I nested, I'd be superhero-size productive. But, alas, it never came. Thankfully, since it was my first pregnancy, I didn't have a little toddler running around to distract me, so I was able to accomplish quite a bit before baby #1 showed up. Potty training with my two year old continues. We've had some great victories this week--she told me she had to go, and we made it to a public restroom--that's the first time we've had a success outside of the house without me just sitting her on the potty. 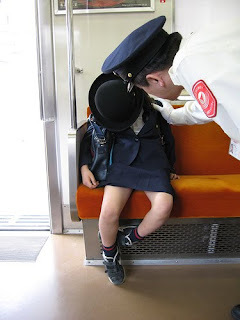 We've had some failures--she refuses to tell me she needs to go at the beginning of the day. And we've had some semi-victories: she tells me she needs to go, sits on the potty, but nothing comes out. And, right now our world revolves around stickers. You should hear her yell, "Sticker?!" when we check for dry pants or she goes on the potty. She gets so excited. So, I think we're doing well. We're already into week three. We're nowhere near mastering this thing. Since I'm putting her in diapers for nap time and overnight, our time to train is limited. If she wets during a nap and at night, there's not a lot of other chances throughout the day to train. Is this normal? Should I have her nap in training pants? Plus, if we run an errand, go swimming, etc., inevitably we lose another chance because she's wearing a pull-up. Ahh, the joys. Twenty-five weeks already? Is that possible? Three measly months until baby ninja is here? Yikes! This week has been a huge test of pregnancy brain and hormonal overload. I decided to potty train this week, which would give me a four-month buffer before baby 2 gets here. So I read my books (mainly followed Toilet Training in Less Than a Day), bought training pants and underwear (I was shocked that most people skip training pants and just use pull-ups--that seems like it'd be confusing because they're so similar to diapers), and loaded up on treats for rewarding my daughter for dry pants and going in the potty. Well, the day before we started, our AC went out . . . again. Happens every summer, and we usually do a semi-cheap patch to get us through to the next summer; but this time I was done. We decided it was time for our 40+ year-old system to retire and a new one that actually cools our house to less than 78 degrees be purchased. Being a the Type-A that I am, I decided that it'd be no problem to continue with potty training plans while sweating profusely at home and entertaining various AC salesmen trying to sell me a system that cost, hmm, about the price of my firstborn. Needless to say, sticky sweaty bodies means even more difficulty for my little one to learn the fine art of pulling underwear up and down, and an overheated pregnant mama does not make for a very enthusiastic and positive teacher. Again, determined to cross potty training off my list in the timeframe I had previously decided, I forged ahead. We ended up moving in with my parents until we could sort out the AC thing, which meant I was not there 100 percent of the time for the training; so my daughter had two teachers, two houses to learn in, and, well, let's just say we weren't trained in less than a day . . . it's been a week, and we've just hit the crying, kicking, and screaming protests when we insist she go to the potty because she's doing the tell-tale tippy-toes dance on my mom's carpeted floors. Sigh. I should've let this one go until the AC was installed, but now that I'm in the middle of it, I refuse to give up. I've been encouraged that the parents that are the most persistent are the most successful; plus, I've read more than once that starting and stopping potty training further delays progress. I know, I know. There are tons of stories out there of people who stopped and started, and everything turned out just fine. I'm well aware of the fact that everyone's different. And, yes, I'd probably be fine if I threw in the towel and restarted at home. BUT, being a type-A, being less than four months from delivery of baby #2, and being stubborn, failure at this point is not an option. I will endure! Well, for those of you who aren't scared off by now . . . back to pregnancy stories =) Got my first pregnancy-wake-you-from-a-dead-sleep-with-excruciating-pain charley horse last night. Whew, was that fun! Thankfully I'm not sore and hobbling the next day like I was with my first pregnancy. I've heard staying hydrated and eating bananas helps keep these things at a minimum--so I've got to up my intake of both H2O and bananas. I'm really, really excited about having a fall baby. Holding my five-month-old niece and nephew and feeling their warm cheeks when I kiss them just makes me more excited. The nursery is nowhere near ready for this baby, but I know that really doesn't matter. But, we did take advantage of Memorial Day sales and bought a ceiling fan for the nursery. There's at least one thing I can cross off the list! Only 112 days left (less if I deliver when I want to--about a week early). Things are really starting to feel like they're going a lot faster. Three and half months sounds like a long time, but then again, it doesn't. I'm starting to get pretty sentimental about my time with just my firstborn. A friend of mine on FB talked about being a little sentimental that her second baby was coming because it meant she wouldn't have the exclusive time with her firstborn (I can certainly relate). Everyone's comments assured her she was completely normal, and it's just as wonderful with two as it was with one. Regardless, I teared up just reading the comments. Actually, I've been tearing up a lot lately. Holy emotions! I was not this sensitive the first time around. A (my firstborn) had her second birthday, and it was a complete success! I didn't do a party because it's too much chaos and money for something my daughter's not really going to understand anyway. Instead, we took Saturday morning and dedicated it to A. Shortly after she woke up, she opened her first present--modeling clay, crayons and colored pencils. We promptly sat down and put all of them to use. 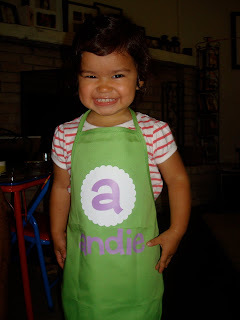 Then my hubby insisted on opening her apron--the one he picked out. She loves it! I love the modeling clay--it smells so yummy, and I don't have to worry about it going in her mouth. A used it as "food" and put it in different bowls and pans and stirred and served it to us. The next present she opened was finger paint. We stripped down to bare essentials, headed outside, set up a huge cardboard box (leftover from my parent's kitchen remodel), and she went to town on the box. 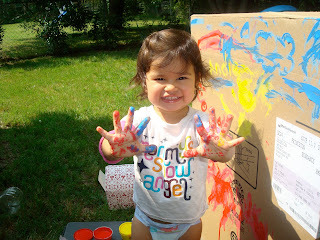 By the time she was covered in paint, we filled our kiddy pool, rinsed off with the hose, and spent the rest of the morning playing in the pool. Lunchtime came, and we opened another present (clothes), and then it was nap time. We went out for dinner that night (A probably could have cared less), and we told her after dinner we'd go and get a cupcake. Well, that was the magic word for "don't eat your dinner and just get really hyper instead" because she spent the rest of the meal picking at her food, crawling out of the booth, asking for a cupcake every five seconds, and trying to visit all the tables surrounding us. 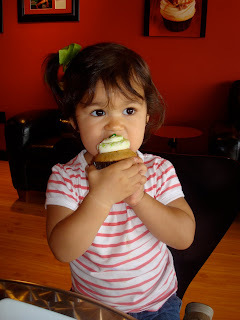 We let her choose her cupcake flavor, carrot cake (girl after my own heart! ), and when she was only halfway done, the sugar high kicked in. She spent the rest of the time running circles around our table while chanting, "Run, run, run, run, run." It was pretty hilarious. All-in-all, a perfect choice for the two-year birthday celebration. Plus, I loved that my hubby got tons of playtime with A (something that doesn't happen often because of his work schedule). That meant more to A and to hubby than an expensive party ever could have. Yikes, this is going fast. 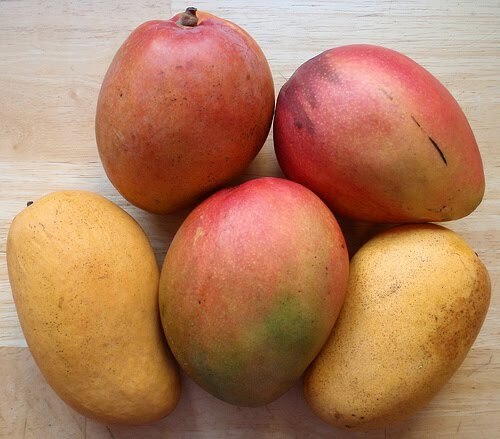 Only 17 more weeks to go, and little mango is determined to make its presence known. I have to admit, as I've pondered what to write about this week, I've found myself dwelling on little more than my discomfort and longing to have my body back. Mother of the Year right here! Yikes, how selfish does that sound? On a happier note, I'm getting really excited about the baby stage. I know when you're in it, it's easy to get caught up in figuring out how you can possibly get anything done around the house--but the cuddling, the sleeping on your chest, the tiny toes and fingers . . . they grow so quickly. I'm really excited to have a little tiny baby in the house again. Plus, my daughter is fully taking on the mother roll with her dolls. She shushes them on her shoulder; she reads books to them; and she generously shares her snacks and agua with them whenever they're close. My favorite observation so far is that when she puts her dolls "night night," she covers them (I mean completely covers them, head and all) with her blankets. Where'd she learn this? I promise, I have not demonstrated any baby suffocation techniques for her. And since the TV is on so little in our house (right now the only thing she watches is the sole Veggie Tales DVD that we own), I know she's not getting it from there. Who knows? I also ordered and received my giraffe print in the mail. I'm basing my entire nursery off of this--colors and everything. I'm so excited! Oh, and my daughter's two-year birthday is this weekend. I've chosen to play it really low key this year. 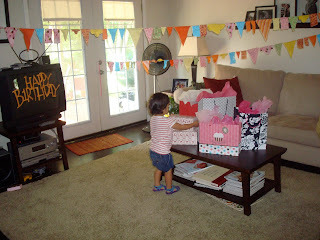 I just don't see the point of going all out on a party my child will not remember. Instead we're celebrating with each side of the family during our normal Memorial Day or weekly family events. A cake (probably covered in strawberries since that's one of my girl's favorite foods) and some decorations are all we need. Instead, I've allowed myself to buy a bunch of presents . . . in fact, I had so many fun ideas I couldn't buy them all. But I figured with not spending as much on a party, I could ignore some of the budget to buy just a few more cute things! And a new Veggie Tales DVD so we can have a tiny bit of variety! Birdhouse for our backyard. Don't you love the use of the knobs? I'll try and post pictures soon!